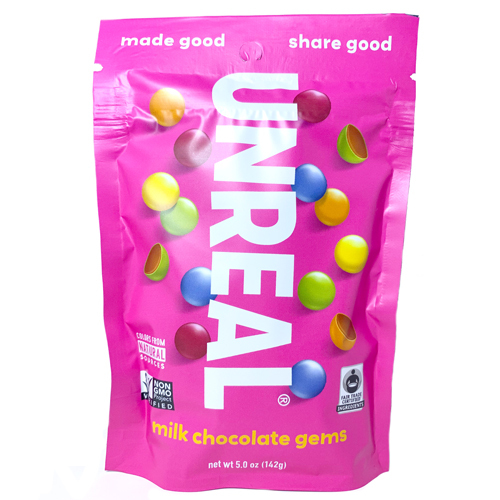 Ingredients: Milk chocolate (organic chocolate liquor*, organic nonfat milk, organic whole milk powder, cane sugar*, cocoa butter*, organic blue agave inulin, sunflower lecithin, vanilla*), organic cane sugar*, rice starch, colored with (tumeric, beet juice, spirulina extract, red radish juice), gum accacia, carnauba wax tapioca starch. 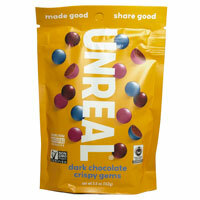 *Fair Trade Certified by Fair Trade USA. 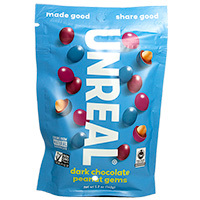 66% Fair Trade Certified Ingredients. From the package: Contains milk. Made in a facility that handles peanuts, soy, tree nuts, wheat. Additional information from the manufacturer: From Package: Contains milk. Made in a facility that handles peanuts, soy, tree nuts, wheat. Each 5 oz bag contains about 157 gems and is 1.5" x 5.375" x 8".